I had a revelation. It came to me in a vision – like Moses receiving a touch of tablet-based life guidance up Mount Sinai. Or like Darth Vadar finally realising The Emperor was quite the plonker and could really do with being hurled into a big hole. 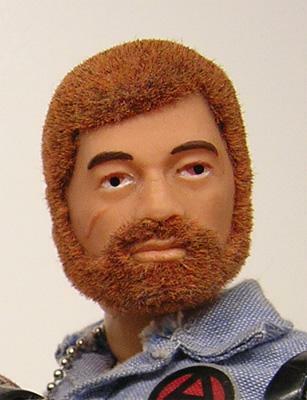 Or Noel Edmonds thinking ‘I know! I’ll dye the beard! That’ll keep me young and relevant and not make me look at all like a creepy, face-fuzzed, Action Man doll that’s come alive and started presenting Deal Or No Deal’: I decided I’d start a running blog. To share my pain anguish crushing insecurities joy of running with like-minded folk. After all, just how had the collective running world made it this far without hearing about how, at the end of a run I like to sit on a step by my patio and let the perspiration form a ‘sweat puddle? Or acquiring a yoga mat from a shop in central Middlesbrough amidst an atmosphere of hysterical terror? Or encountering an elderly chap at 6:40am, wading shin-high through a beck, adorned in only a tight fitting pair of beige shorts whilst puffing away on a pipe? How indeed. Things heated up in July. And not in a way that implies conflict or an intimate encounter or some sort of outstanding achievement. No, I mean literally. I almost melted at The Croft Pitstop 10k where temperatures reached an estimated 168 degrees Celsius. Then only a few days later I sweated around stupid, hilly streets for a middle-class running spectacular at the Harrogate 10k. Neither race resulted in a medal. Not that I’m bitter *screams into pillow* Towards the end of the month I went for a 10 mile run in the Lake District and got lost. For a while. But I panicked, had a bit of a cry, composed myself and got there eventually. Which, coincidently, is a broad synopsis of the worst ever episode of The A-Team. As the year progressed, the races came like an express, viscous milkshake – thick and fast. First it was something of a taster as to the marathon to come, when I hit York for a mere 10k. I saw a man punch a bee out of the air. It was one of the most remarkable things I’ve ever seen. Then it was on to Darlington for 10 more kilometres. And away from the glitz and glamour of the North-East amateur running circuit, I was putting in the hard miles ahead of the ol’ 26.2. In fact, I put in 153.4 miles in August. That’s ridiculous. For me, anyway. 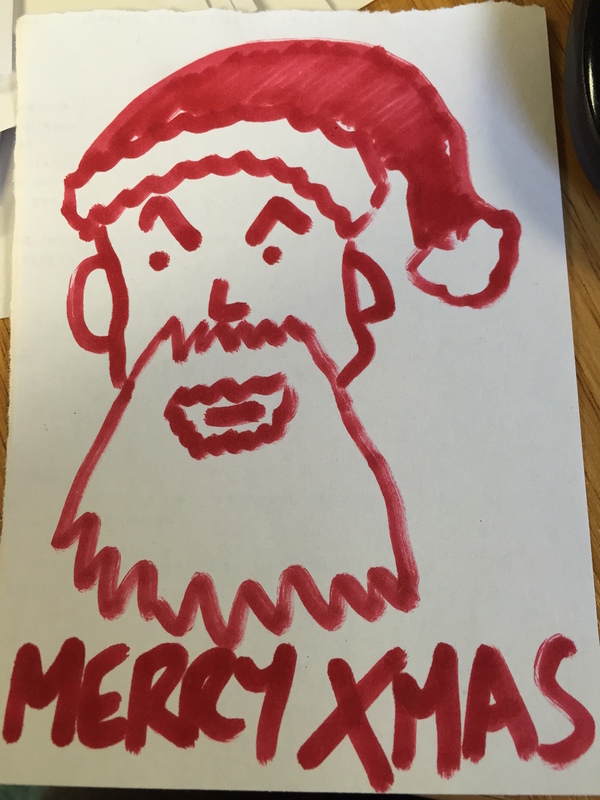 A hand-drawn Santa. Look, he’s not been well…its the thought that counts. This entry was posted in Reviews and tagged exercise, fitness, health, humor, humour, jogging, marathon training, running, training, yorkshire marathon. Bookmark the permalink. Oops, I laughed a bit too hard at the last paragraph. Merry Christmas!